Last year at CES, Lenovo was all about its “bendy” convertible Ultrabook, the IdeaPad Yoga, and the upcoming Windows 8 operating system. This year, the Chinese computer maker is going big. Literally. Called the IdeaCentre Horizon, this Windows 8 table PC (table tablet? coffee-table computer?) is running on a third-generation Core i7 processor with Nvidia GeForce graphics. 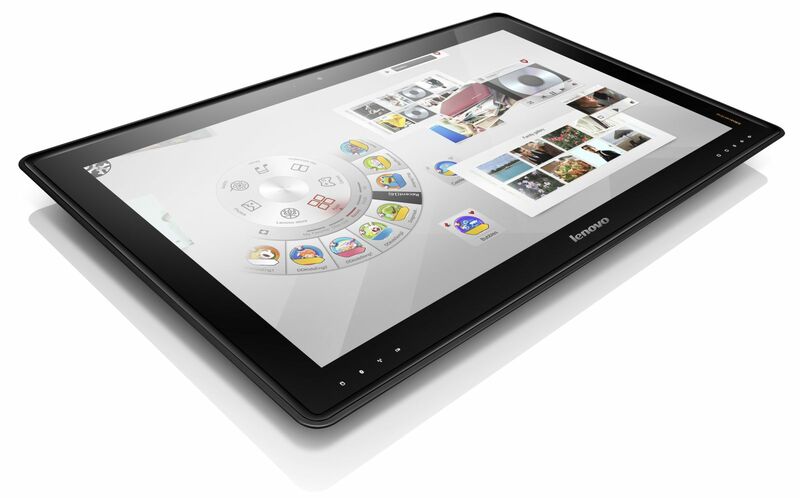 It has a full HD, multi-touch touchscreen display with a 16 by 9 aspect ratio. There’s a 720p front-facing camera for Web video chats. It’s also adjustable, so it can be propped up and viewed in different modes. With customized games from Ubisoft and EA, and compatibility with joysticks and other accessories, Lenovo is clearly trying to target the game-playing crowd in addition to average consumers, some business users, and 6’7″ basketball players. Lenovo is calling this the world’s first “table PC,” which may be the case, and it is a whopper of a computer. But it’s not the first attempt at a big touchscreen device aimed at family time around the coffee table. Who could forget this ridiculous 65-inch Android tablet? There’s the Sony Vaio Tap 20, reviewed in full here by my colleague Bonnie Cha, which is a 20-inch all-in-one PC screen with a kickstand. And last summer Toshiba launched the Excite 13, a 13-inch tablet designed primarily for use in the home — which The Wall Street Journal’s Katie Boehret thought was great for entertainment, but concluded that bigger wasn’t always better. The Horizon is expected to ship this summer, and will cost $1,700.